Sailors from novices through to capable club sailors are well catered for at the Club. Those wishing to learn can also join one of our RYA recognised training courses. 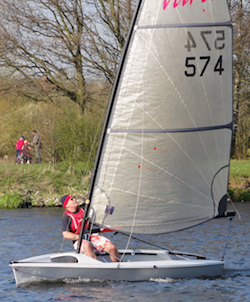 The Club currently has fleets of Laser, GP14, Topper, Enterprise, Albacore, National Twelve, Comet, Solo, Lark; and welcomes other monohull dinghies without trapeze up to 4.6 metres in length. Bowsprits may not be deployed during Club racing sessions. We run a full racing programme from late March until Boxing Day. The Club year runs for 12 months from 1st October. The subscriptions below are for the Club Year commencing 1st October 2019. These fees will cover Membership until any change is agreed. The 2018 – 2019 (current) subscriptions are shown in brackets. Discounted fees apply for joining the Club during the Club Year from May onwards. Associate Members are the partners of Ordinary Members. Junior Members are over 12 and under 18 years of age at the beginning of the January in the Membership year. Family subscription covers children from 12 years of age at the beginning of the January in the Membership year. Intermediate Members are aged over 18 and under 22 years of age at the beginning of the January in the Membership year. Senior Members are retired and are over 60/70 years of age at the beginning of the January in the Membership year. Non-Sailing-Adult Members are responsible for Junior members and children under 12 years of age at the beginning of January in the Membership year. Social Associate Members are the non sailing partners of Ordinary, Non-Sailing-Adult and Social members. A membership fee is not required for children under 12 years of age, however at least one of their parents needs to be an Ordinary, Associate or Non-Sailing-Adult Member of the Club.